Some have studied this course and passed the FAA Remote Pilot Computer Exam in 7 days! Whether it’s flying a drone as a hobby or for making money, obtaining a FAA Remote Pilot Certificate is a very rewarding accomplishment as well as a smart thing to do. The future of autonomous robotics with drones and 3D flight software applications is here. So whether you’re into 3D mapping software development or just a drone enthusiast, getting your FAA Remote Drone Pilot License will set you apart. 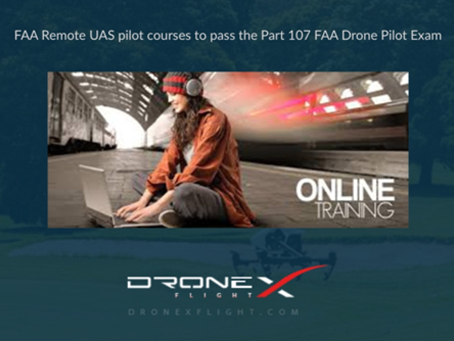 Get professional UAV pilot training, FAA drone training and much more with DroneX. UAV - Unmanned Aerial Vehicles have become an obsessive craze recently and to earn money from it you must hold a FAA Remote Pilot Certificate and operate in compliance with Part 107. So let us take care of your training as you take our UAV pilot training course to pass Part 107 Drone Pilot Exam. Schedule to take the FAA Remote Pilot UAS Test at one of the FAA certified Knowledge Testing Centers (KTC) near you. 60 question - 2 hour timed / Multiple Choice / Computer Based Test You do not need to own a drone nor fly one for the exam! After passing the Aeronautical Knowledge Test. Register & complete FAA Form 8710-13 for a Remote Pilot Certificate using the electronic FAA Integrated Airman Certificate and/or Rating Application system (IACRA). Congratulations! Start making money flying Drones. A permanent remote pilot certificate will be sent via mail once all FAA-internal processing is complete. An email with a temporary Certification will be sent prior to your permanent certificate arriving. Register now for our online UAV pilot training course, at an affordable price! Do you think you have what it takes to fly a drone?